about the development of minimum-space layouts in the United Kingdom. The name “Micro Layout” has only been in regular use in Britain since about 1990, but the concept goes right back to when railway modelling was starting to become a separate hobby from model engineering. 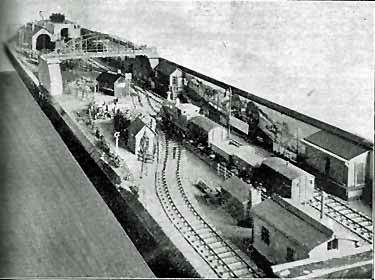 In 1925 A. R. Walkley exhibited his Portable Goods Yard, a folding layout that opened out to 6x1ft using the now familiar Inglenook plan, though with longer sidings and a loco shed spur. 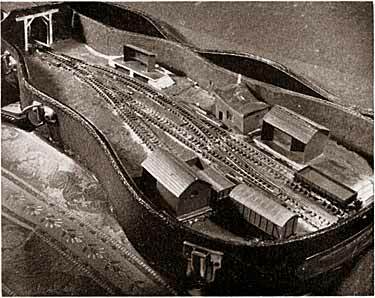 Its purpose was to demonstrate that a practical working layout was possible using 00 gauge (16.5mm) track and a scale of 3.5mm/ft. with small British locomotives*. Walkley also used the layout to demonstrate other ideas that we now take for granted — the use of permanent magnet motors to allow locomotives to be reversed simply by changing the track polarity, two rail pick up, automatic couplings, and not least the idea that a model railway should have room for scenery as well as track — a departure from model engineering where the focus is on the locomotives and the track is generally just something to run them on. * In the 1920s and 1930s 00 and 0 referred to the gauge not the scale, and an argument raged about whether it was better to use the correct scale of 3.5mm/ft for 00 or to adopt a larger scale of 4mm/ft to compensate for the small size of British rolling stock and make locomotive manufacturing easier. Unfortunately the 4mm lobby led by Henry Greenly won the argument. Walkley’s response was to coin the term half 0 or H0 for 16.5mm gauge at a scale of 3.5mm/ft, and most of British railway modelling has been out of step with the rest of the world ever since. Walkley’s goods yard caused a sensation but it was essentially a demonstration layout and there don’t seem to have been any similar minimum space layouts during the inter-war years. After World War II though, interest in very small layouts amongst space starved modellers started to increase. The first true micro layouts may well have been the two 3x1ft stations that formed J.A Patmore’s 00 gauge Larpool and Easington Railway which appeared in Railway Modeller magazine in March 1956. Each station was built into an open box and the two bolted together for transport. The stations were linked for operation by sections of plain track, an idea that is still useful today. The 00 scale Larpool and Easington stations were very cramped but the arrival of smaller commercial scales made the microlayout builder’s task far easier and in 1967 came a TT-3 version of Larpool and Easington (shown at left). 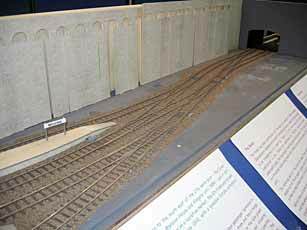 This was a very attractive industrial layout again based on two modelled sections linked by plain track but now each section was just 32″ x 8″ so a true microlayout even when taken as a whole. The arrival of commercial TT-3 also led to at least one layout built into a coffee table and both track and rolling stock were quickly adapted for 3 foot gauge narrow gauge railways, often on small shelves, in 00n3. Even in its 00 form at 80x9in Minories was only about 25% larger than the four square feet of an “Arendtian” micro layout, though nowadays most people make it somewhat longer to avoid having to use very sharp turnouts. Minories has of course been built by countless modellers, and to celebrate its anniversary members of The Model Railway Club in London, where Cyril is still a member, are building a version of it in EM gauge keeping as close to the original plan as possible (photo at right by David Thomas). The game was to reverse the order of a five-wagon-plus-guards-van goods train in as few moves as possible. As there are no photographs to illustrate the article it seems likely that it was set up by simply pinning proprietary track to a suitable piece of board, something that anyone who wants an instant Ingelnook can still do today. In July 1965 the Rev. P. H. Heath (who, with his Llanfair shelf layout three years earlier, had been one of the pioneers of 00n3) described his 4mm/ft scale Piano Line. This was an excellent example of a minimum space layout and adopted the ingenious idea of bringing the main line in centre stage (upstage centre if you want to be theatrical about it) within the run round loop. There are prototypes for this, though possibly not in Great Britain, and it enabled a fully operating layout complete with arrivals and departures of both passenger and goods services to fit onto a single 5x1ft board including its off-stage fiddle yard. The arrival of commercial N gauge in the late 1960s led to a spate of very small self-contained layouts such as C. J. Packham’s neat Little Fiddle Railway built into a violin case (shown at left). A number of rather more gimicky layouts were built into file boxes, slide cases and every other container imaginable, but more serious minimum space layouts now began to appear fairly regularly in the various model railway magazines. 1979 was a key year for the micro layout concept for it was then that Alan Wright first exhibited his original Inglenook Sidings at the Manchester Model Railway Show, complete with the now famous 5,3,3 shunting puzzle (see Scrapbook #38). 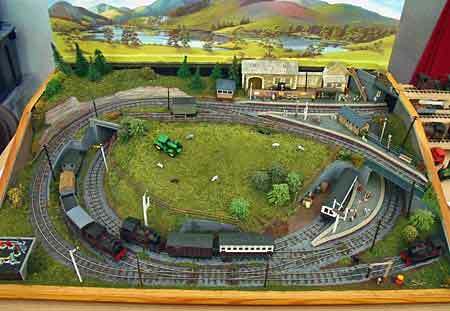 Alan’s efforts proved that a layout this size could offer serious operating potential even without a run round loop. Chris Krupa’s tiny layouts were influential beyond the British Isles. 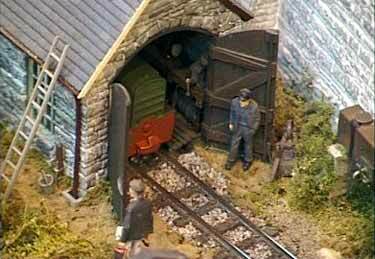 As a regular exhibitor at the annual Expométrique narrow gauge exhibition in Paris he seems to have inspired French narrow gauge modellers during the 1990s to replace their static dioramas with the tiny working layouts known as “Micro-Reseaux”. A few years later, in the 1980s, a series of very attractive small tramway layouts started to appear in the pages of Continental Modeller and at various exhibitions. These were built by Don Sibley and despite their size often had very reasonable operating potential. City trams (streetcars) with their sharp curves lend themselves to micro layouts. In the November 1989 edition of Scale Model Trains, Julian Andrews described his first attempt at modelling a U.S. short line. 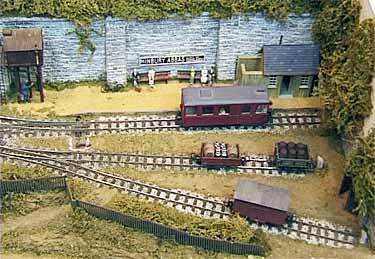 This was the Eastport and Calais Railway (right) occupying just 51x9in including the fiddle yard. Without a run round this provided work for two locos to shuffle cars into the various sidings. Throughout their long history there had never been a generic name for all these tiny layouts. They had generally been described as “minimum space” … “compact” … or simply “very small” layouts, but in 1987 an article by Giles Barnabe in Scale Model Trains describing plans for minimal space 0 scale layouts was punningly titled “Micr-O Lines”. In a later article in 1989 the tag became “Micr-O Layouts”. However, the first use of the term “Micro Layout” so far discovered was in the February 1988 edition of 009 News (the journal of the British 009 Society). Kevin Payne used it to describe a 48x12in layout in two halves. Coincidentally that layout, Orznash, is featured elsewhere on this site. 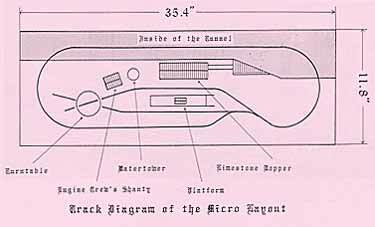 Though nobody is really certain exactly when and from where the word microlayout first entered the British railway modelling dictionary, the concept it describes has been around in Britain for almost as long as there have been railway modellers. Today layouts are being built in shoe boxes, file boxes, pizza boxes as well as the familiar silver photographic box. Just to really drive the point home, at the 2006 Expométrique show near Paris Chris Krupa set out to build a complete microlayout from start to finish during the three days of the show.